Feral pigs were introduced in the 1800’s (and perhaps earlier) to coastal and inland California. Facinating creatures that they are, these non-native ecological rototillers (seeking their soil-borne food) can quickly destroy native vegetation, and disrupt the ecology of entire hill sides. How are populations of feral pigs (often also called “wild pigs” in California) grouped across the California landscape? What are important social factors that are associated with human-assisted movement of feral pigs? We collaborated with the US Department of Agriculture, California Department of Fish and Wildlife, hunters, and ranchers to collect, then analyze DNA data from feral pigs throughout California. 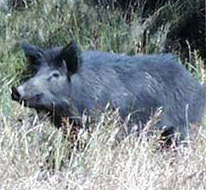 This project is helping to identify ecology of feral pig populations in California, specifically how different feral pig populations interact with each other. 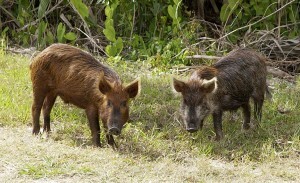 This information can be used to better understand the lifestyle of these unique and invasive animals as well as to manage feral pig populations and the diseases they can spread. Scott Morrison et al 2007. Facing the dilemma at eradication’s end: uncertainty of absence and the Lazarus effect. Frontiers in Ecology and the Environment (Ecological Society of America). 5(5) 1540-9309.